Penguins in Paradise Slots is a great 5 reel 25 paylines video game featuring free spins, bonus game, great graphics and many other intriguing features. It was developed by Cryptologic in 2009, but today it already has a real ARMY of fans. No wonder – the game unites top-class bonuses and great payouts. Don’t you believe? Dare you try! You can also play this game instantly with the FAST-AND-FURIOUS no download version allowing you to get rid of unnecessary downloads, installations and other bla-bla-blas. Do you thinks all penguins like those BLOOD-FREEZING Arctic waters? Of course, not – this amazing slots machine tells us a story of a cute penguins family boooooored of monotonous white colours around. They decided to travel to tropics, but to have a great rest they need a lot of money, so the top jackpot of 5,000 coins or $100,000 will be just a great option for it. Like in most Cryptologic slots, here you can try to win some Bonus Games extra cash. This game offers you two different bonus features. The first incrrrrredible is the Free Spins mode played right on the reels. 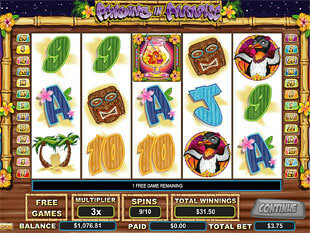 The other bonus is a separate game played on the second screen – in it you can win great sums of REAL CASH. The bright design allows you to feel in a real resort together with the cute penguins. Many animated symbols turn this game into a real cartoon, and special sounds give you the mood of FUNtastic holidays. To help those little penguins you’ll need to strike nice winning combinations of the following symbols on the reels: Mr. Penguin, Mrs. Penguin, Penguin Kid, Mask, Palms and HOT Cocktail. These featured symbols will appear on the reels together with classssic yet really helpful icons of Nine, Ten, Jack, Queen, King and Ace. 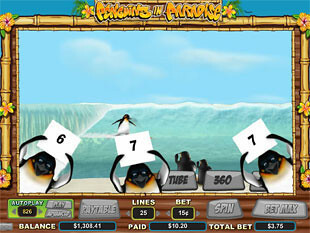 This game is balanced really well, so both high-rollers and careful players will find opportunities to win great sums at Penguins in Paradise slots. The risky bastards who like to stake the top can choose the maximal bet of $500 and try catching lucky strikes. If you are careful, and some friends call you a coward – don’t you give a fig about ’em and try this game with the minimal bets varying between $0.01 and $0.25. The main thing allowing you to vary bets between $0.01 and $500 is the coin size. The coins vary A LOT in this magnificent slots – you can try careful values of $0.01, $0.02, $0.03, $0.04, $0.05, or $0.10, $0.15, $0.20, $0.25, $0.50, $0.75, more risky $1, $2, $3, $4, $5, $6, $7, $8, $9, $10, and really REWARDING $11, $12, $13, $14, $15, $16, $17, $18, $19, $20. With this range you have no chances for getting bored. The highest jackpot is 5,000 coins or $100,000 for 5 Mrs. Penguin symbols. 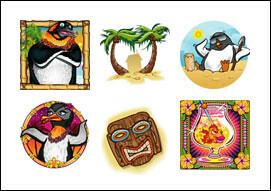 The second jackpot is 1,000 coins or $20,000 for 5 Pinguin Kid symbols. The third highest jackpot is 500 coins or $10,500 for 5 Mask symbols. Like in many slots, here you are suggested to make a good match even if one, two or three symbols are missing for that. To do this you only need to strike the wild symbol of Mr. Penguin on reels 2, 3 and 4. The tough penguin dad will substitute for any icon appearing on the reels except the scatter Cocktail. Also, in case you hit wild symbols on all 3 available reels, you can win a featured Bonus Game played on a different screen. 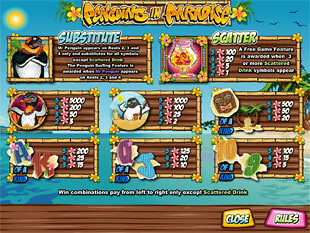 The scatter symbol of this game is the HOT-AS-TROPICS Cocktail with a delicious fish – quite what penguins like! The scatter icon can appear anywhere on the reels, even out of paylines, and will award you extra cash if two or more symbols match during one spin. When 2, 3, 4 or 5 Cocktails appear on the screen, the sum of your total bet is multiplied by 1, 5, 20 and 100, so the maximum scatter win in this game is a HUUUGE sum of $50,000. Besides, when you trike three or more scatter Cocktails at once, you get a good number of Free Spins. Bonus Game. If you always ask for more, Cryptologic developers suggest you to try a bonus game played on the second screen. In this game you will help Mr.Penguin to make a couple of HEAD-SPINNING surfing tricks to get awarded nice sums of bucks. The feature is triggered by all 3 wild symbols. After every trick you make while playing the bonus feature three penguin judges appear on the screen to mark your success. The prizes given in this game are proportional to the sum of your total bet, so if you want to win really much, stake more. For instance, we won $197 with only $3,75 staked in this game. Free Spins. The free spins mode is awarded to you when you strike three or more scatter icons of Cocktail. The prize of this bonus feature is 10 Free Spins for you to fully relax and wait till the game gives you fantastic sums. Another interesting option is that all your wins during the free spins are multiplied by 3. 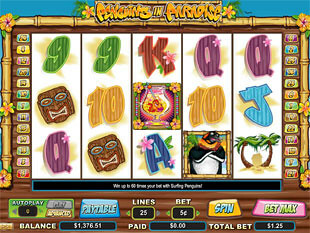 Penguins in Paradise slot machine is a game full of exciting features and extra cash awarded to you in bonus games. Amazing cartoon-styled graphics, animations and great sounds let you feel like staying at a real beach, next to the penguins having fun. Bets range, nice payouts and bright colourd won’t let you get bored while playing this slots, so hurry up and earn your first bucks!